LEGO BASEPLATES DUPLO BASEPLATES…in the case of our Nilo® brand baseplates…YOU GET BOTH USES FROM JUST ONE BASEPLATE thanks to it being 2-Sided! Read on…….. 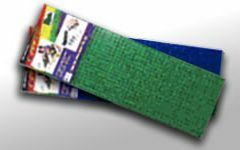 Lets start with the fact that our Block Mats, or baseplates are MADE IN THE U.S.A.! They are semi-rigid, have some weight to them and are injected plastic, not pressure formed nor silicone as with many others out there. This makes them the absolute best available baseplates sold! 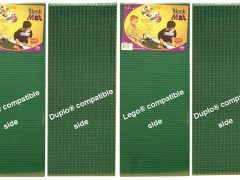 Our NILO baseplates, Block Mats as we call them are both LEGO and DUPLO compatible! They are Lego on one side and Duplo on the opposite side! This allows dual usage from just one Block Mat! They measure 12″ x 32″ each….they are very LARGE baseplates. When you consider purchasing baseplates from other companies keep in mind that you are buying just ONE USE of baseplate…NOT both uses….Lego AND Duplo. This then means you are saving a lot of money since our one baseplate does the work of both bricks. 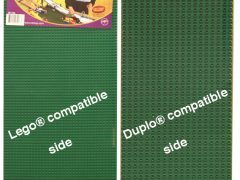 With our dual use aspect we have found that our baseplates are about 60% of what you would normally pay buying another brand to have both lego and duplo use covering the general area or size of our baseplates. This means VALUE! Since our baseplates are 12″ x 32″ they are designed to simply drop into our Small or Large tables! They also fit other tables out there…you just need to check the measurements to make sure. They are removable, easy to clean! You may start a project on them….remove the baseplate with that project in order to use our NILO table for some other activity like Puzzles, Play-Doh, Lincoln Logs, homework, arts or crafts….THEN, simply place the baseplates with project back onto the table to continue building on them! 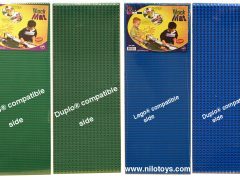 We offer our Lego and Duplo Baseplates in both Green, and also Blue. We sell them in pairs and also in 4’s. An G2 means 2 Green Baseplates which is 2 pieces that are 12″ x 32″ each…which is an 24″ x 32″ total area. Again, Lego on one side…Duplo is on the opposite side. Lego Baseplates, Duplo Baseplates are a staple for most families. Building Lego is great for a child that is maybe 4 and up. Building Duplo is primarily for younger children. 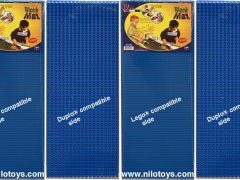 Nilo Brand LEGO BASEPLATES are made in the U.S.A.
NIlo Brand DUPLO BASEPLATES are made in the U.S.A.
Again, the above baseplates are just one, 2-Sided Baseplate that features Lego on one side and Duplo on the opposite side. It is a proven fact that when children use their minds to construct, build, play with wooden blocks, legos, puzzles their minds develop much more fully than if you just let your child play video games. In fact, a study was done that had a child stare at a blank white wall and the activity going on in the childs mind was much more robust, profuse than that of a child playing a video game. Interesting, yes! Please make sure you child plays with a multitude of toys, not just electronic toys. G2 Nilo® Baseplates, Lego/Duplo® compatible.